Turf Pride offers parts for the majority of our products. If you need a replacement part, simply find your product below to be taken to a list of parts. 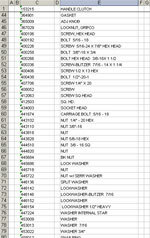 From there, you can select the individual part or parts that you need, and place your order. *Please Note: Currently, you may view the available parts for purchase online by clicking the links above. However, all purchases must be done over the phone. We will be adding online credit card purchases for all parts shortly.